The iconic Tiger had a relatively long life in its service, and Ryefield had previously captured various versions of it in a DAK version (5001), early (5003), Fehrmann (5005), middle (5010) and now late (5015). The original releases came with interior and later ones without, including this kit. The late production is mainly distinguished by its steel wheels and various simplifications such as removal of Feifel and smoke generators, and various changes such as different types of hatches. The kit comes with 11 dark yellow sprues, one clear, and a bunch of dark grey tracks in a box. It comes with decals for the 4 vehicles, a PE fret and a length of copper wire for tow cables. As with other RFM kits the plastic is cast in a somewhat shiny texture, but very nicely detailed. Almost all pieces are finely cast, I found very few pieces having a tiny bit of flash such as the bottom cylinder of the exhausts. The kit shares many sprues with previous Tigers, from my cursory check it seems sprue P is new for this release. 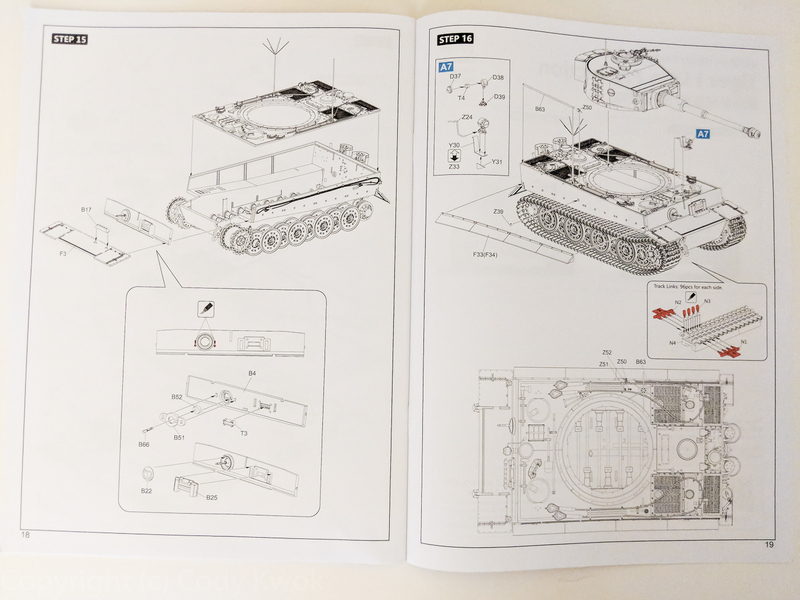 The kit instructions branches out at various points to specify features for the Command Tiger and other late variants, but it did not specific the differences between the three other late variants but instead shows possible options between kit parts, so you need to do your own research, but Tiger expert David Bryden provided a lot of guidance on his site. The kit calls out Ammo of Mig paints. This kit OOB can build into 4 different late variants, including Michael Wittmann’s 007 command tiger, as well as the yellow turret number 312 from Abt 505, “Tiger 1” from Abt 506 and red 221 from Abt 101. These variants all had Zimmerit during the period, the kit came with a PE rake set similar to Tamiya’s offering for you to make your own. 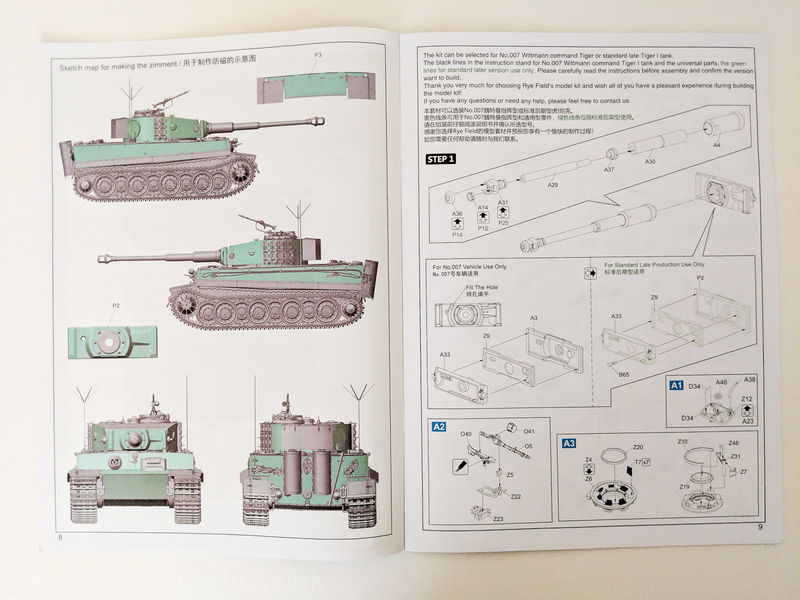 It is also very interesting to note that the pieces of the P sprue allows you to build many versions of the late Tiger that is not one of these 4 variants, so you may wonder for example why the piece P6 has 3 protruded tubes that they ask you to cut off. Turns out Tigers produced after 1944 May have these which from I could make out are the attachment points for 2t cranes. First you need to pick your variant and I did the yellow-bannered 312 as I plan to add the rescue logs it carries after the review, which means I follow the green parts of the instructions. There are 16 steps. As usual RFM starts not with the hull/wheels but with the turret. 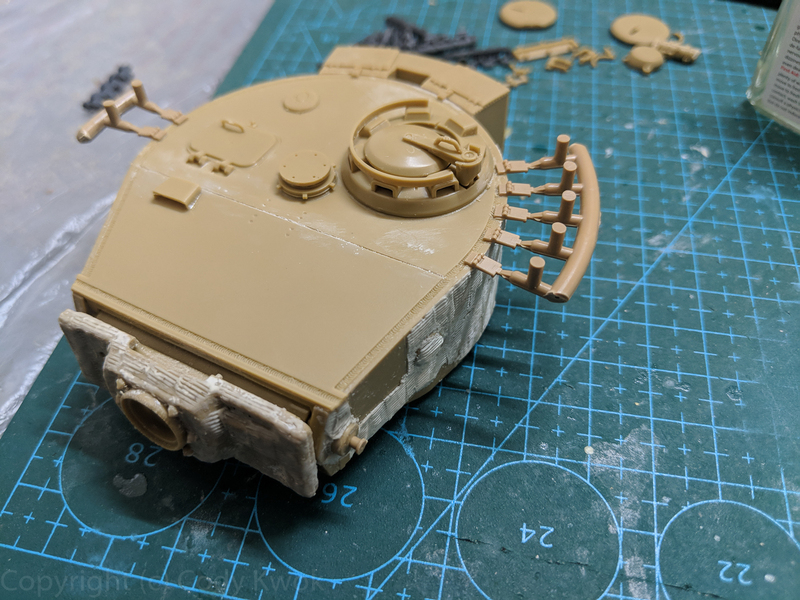 I decided to apply Zimmert to the relevant kit parts first. RFM shows which pieces have them. I used Mr. Dissolved Putty from Gunze and Lion Roar rollers. There are other medium such as epoxy putty, but I find it really difficult to apply to finer details. Bondo is another option and I may do that next time. Either way I think they went ok as a first try. Step 1 assembles the gun with a choice of muzzle brakes with a choice of large muzzle brake (from sprue A) and smaller (sprue P). All 4 variants use the large one. After 1944 April the new smaller muzzle was introduced, so you can use that P sprue muzzle brakes for other late Tigers. The gun barrel is slide molded with multiple sections. Next comes the mantlet, with the 007 having 2 eye holes and the standard only 1. The fit of Z9 on A33 and A3/P2 are very tight, I suggest snapping Z9 to A3/P2 first. Sub-assembly A2 is the MG34 and I left it off since most photos were without it as the gun is usually tucked inside. Sub-assembly A3 builds the cupola. The placement of the periscopes are ambiguous because the rectangular hole is too big for it. I install them close to the center of the circle. You can choose parts Z4 or Z6 with the latter drainage slots. David suggested Z4 is correct but my other reference showed 312 with slots, so I went with Z6. Step 2-5 builds the turret. There is a choice of P3 or P4 for the different hatch hinges, with the latter being the more common choice. There is a choice of P20 or A13 for the escape hatch hinge but the former should be used. In Step 2 they ask you to fill the notch on piece P6, but I’m unsure whether this applies to all late Tigers or just some. There are turrent roofs with weld seams, and this notch isn’t that, and some drawings have this notch. Step 6 adds spare tracks with clamps F36 already in the correct curvature, so I glued F36 as a whole sprue and snipped off the sprue later. I opted to not install the spare tracks at this point for painting, but I’d dry fit it and install F35 onto the turrent. The spare tracks can snap fit into place afterwards. The storage box should be installed on the turrent before applying Zimmerit as you may not get a flush attachment otherwise. Step 7 builds the back of the vehicles with a lot of holes to be drilled. I missed a couple at the bottom so you may want to be more careful than me. Step 8 builds the lower hull. 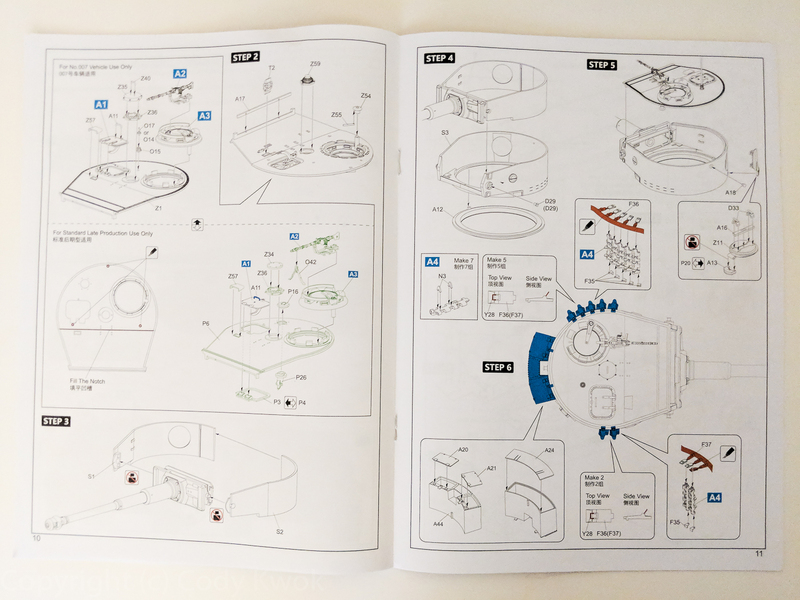 This set of instructions didn’t indicate it but you can easily get working suspension by cutting off the little edge in D57 that fixes the arms. 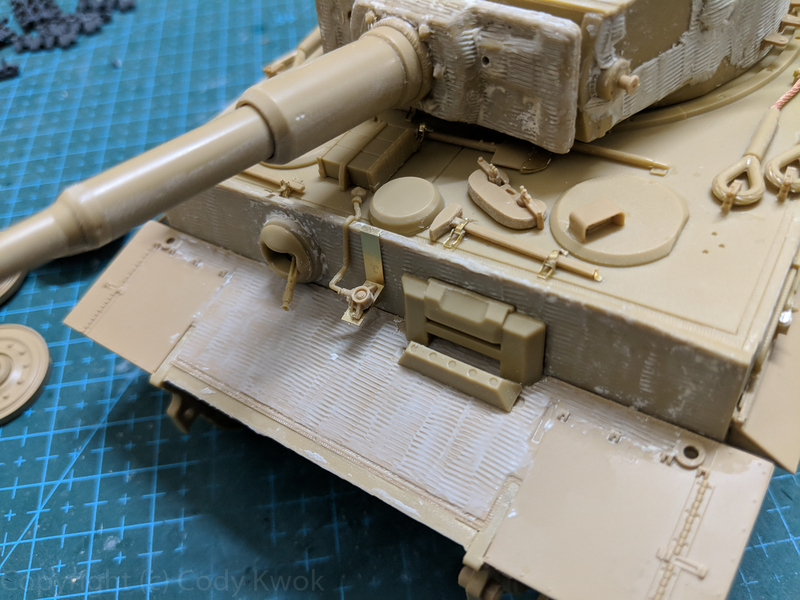 I have done it on their Fehrmann Tiger but found that RFM’s torsion bar connection points to the lower hull is very weak and imprecise so you have to be careful in aligning the arms. It is probably more trouble than it is worth so for this Tiger I didn’t make this change. Step 9-11 builds the wheels, and X6 should be used instead of D49. The fit of the rear panel is very tight, but with some quick setting glue you should be able to get a seamless attachment. There are choices of drive sprockets F1 (concave wheel ribs) or D47 (convex). The instructions are very subtle with which one to use, with D47 highlighted in green for the standard version. 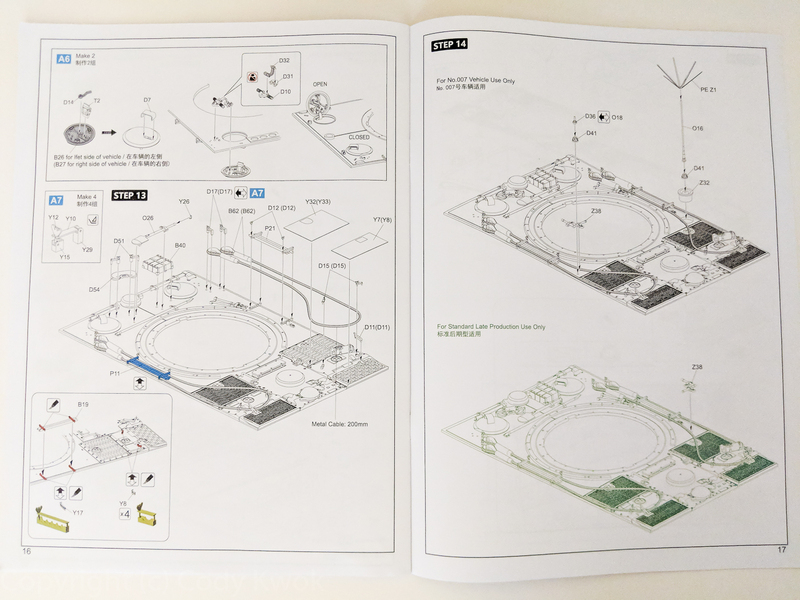 In step 10 you have to install rings D48 and D50. The rings have very tight fit with the nub, they also have different sides with one slanted inwards. It is difficult to get the ring into the nub if you don’t have the slanted side in first. Anyway this tight fit means you may break the suspension arms when you try to install them, so I’d suggest you first enlarge the holes of these rings, and also glue the rings to the respective wheels X2 and X3 so that you can paint them and install them later with glue. Step 12 requires you to drill a bunch of holes. Unfortunately I think one of the holes in the front was not molded on the piece so you need to improvise. 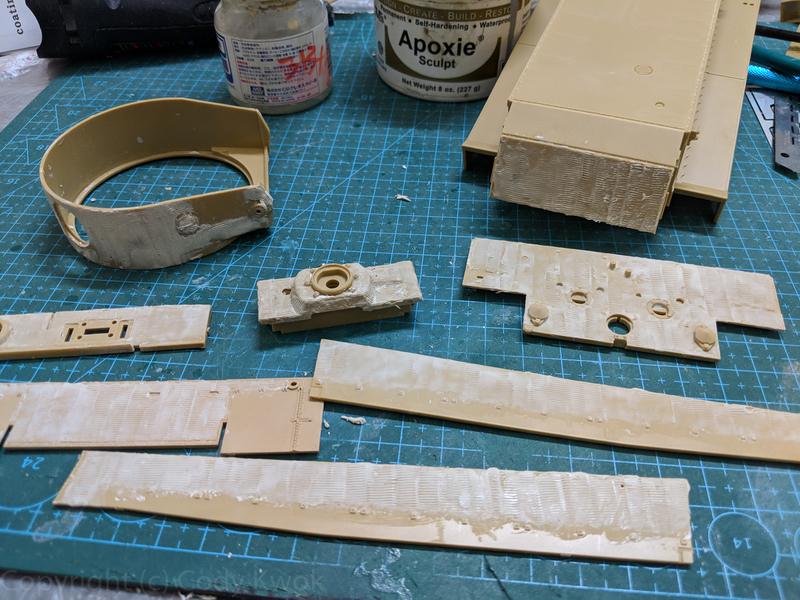 Before dealing with the upper hull with all the intricate parts however, I think it’s safer to first install the upper hull piece so that you won’t mess up the details while fitting it, rather than waiting until Step 15. Then comes the PE tool clapses. If you don’t want to deal with them, the kit offers molded on tools + clapse assemblies. Otherwise it’s patience time… the clapses are pretty difficult to make with the handle Y9 required to hold both pieces Y27 and Y20 as hinges. The method I used was to first bend Y9 right angle on one side and about 45 degress on another, hold the U of Y9 between my fingers, then attach Y20 onto it with a tiny dab of CA on the hinge to keep it in place, then do the same for Y27. Then squeeze my fingers close close the other arm of Y9 onto the hinges. With a bit of wriggling and nudging it’d work. There is also this choice of Y27 or Y20, it seems Y20 is giving a smaller clapse than Y27, but in the end they are quite similar in size and can hold the tools just fine. O6 is a puzzle because it doesn’t have the holder at the right end of the tip, and it doesn’t seem right to just clamp the bar onto the tank without that? So I took B12 and removed the molded-on clamp to replace O6. 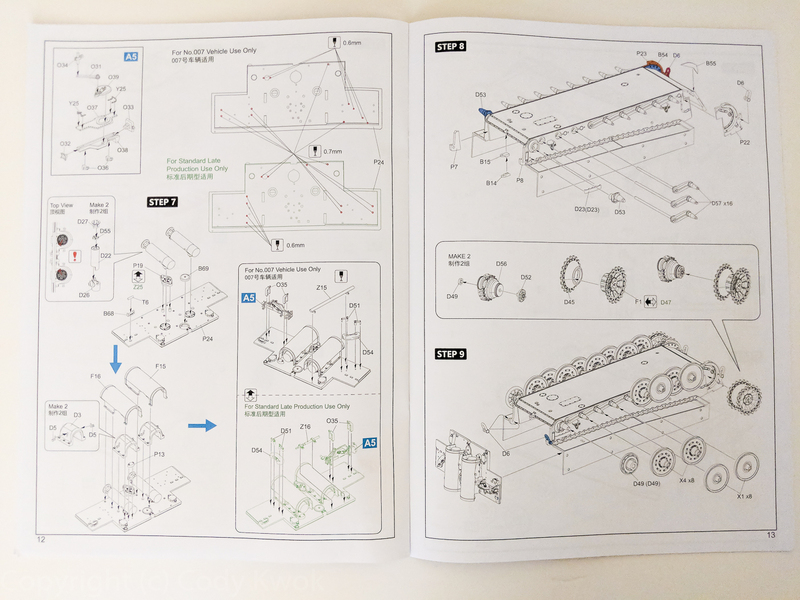 Z51 and Z52 has no guide holes; if you do the standard late Tigers you may find piece Z38 you install later in Step 14 to interfere with them, so I suggest you install Z38 first and Z51 and 52 later. In fact I’m not even sure they should be there at all, as I don’t see any reference with them. The other mystery is part O12 and O25. In the instructions O12 gets one tool clapse, if you do PE, but then below they drew O25 with PE clapse installed so the axe got 3 clapses. All the references I’ve found says 2 clapses to hold the axe so if you use O25 then you just install it straight away, or you use 2 PE clapses for O12. Step 13 is the rest of the upper hull assembly. It is nice that RFM provides a good tow cable in the form of copper wire, but the length of 40cm (20cm each) is a bit tight so you don’t want to waste too much of the length. You can do PE rope clamps for maximum details but I want a bit more stability since I want to hang rescue logs off of these clamps. The styrene parts are pretty detailed as is. Step 14 installs the antenna for Command, but here is another mystery. It looks like on regular late Tigers the the antenna parts D41 and D36 are on most vehicles, and they are placed behind Z38. Z51 and 52 doesn’t seem to belong. Cut as many of the track pieces as necessary. If you have a good nipper, the gates on the wide end shouldn’t cause problems as you can get a flush cut, the other end needs some sanding as they may interfere with assembly. Lay all the tracks on the jig built from the 4 N4s. Now cut the N1 and N2 pins as shown in the instructions, note that they are different and the side they are supposed to be on. Also on the N sprue there are 4 unidentified pins, 2 are N1 and 2 are N2. They are useful for backfills. Trim the corners of the sprues from these isolated N1 and N2. The reason is you can now lay a bunch of N1s and N2s alongside each other, if you don’t trim them you can’t do that. The reason why you want to do them all at the same time is because you don’t have to count. If you do them one-by-one you’ll have to revisit where the holes are for the next batch. Before you insert units of pins into their respective holes, apply some glue at the tip of the pins. You need a little glue here because the pins cannot stay on their own. With a little glue the track is still going to be workable. After you insert all the pins side by side, you can remove the sprues. For the N2 pins you can use your nipper to trim them off, but N1 is more tricky because the pins are recessed. Because of the good engineering here you can simply wriggle the sprue until it comes off the pins. For the guide horns N3s, I brush a little Tamiya extra thin across 4-5 tracks, and cut N3s and lay them onto these brushed tracks. The small amount of glue will let you stick the guidehorn on, after which you can apply more extra thin to the assmbly to permanently glue them in place. You can of course apply glue and glue individual guide horns to the track, but I find the assembly line style of planting N3 then glue pretty efficient. Anyway your mileage varies. The pins N1 can come off, so I’d apply a tiny bit of glue on each. I also don’t find any advantage doing N3 the way shown. In the end the tracks are rather painless after you get on a groove. Decals are very nicely printed, especially when you compare the large insigna printed for Tiger 1 with other kits. 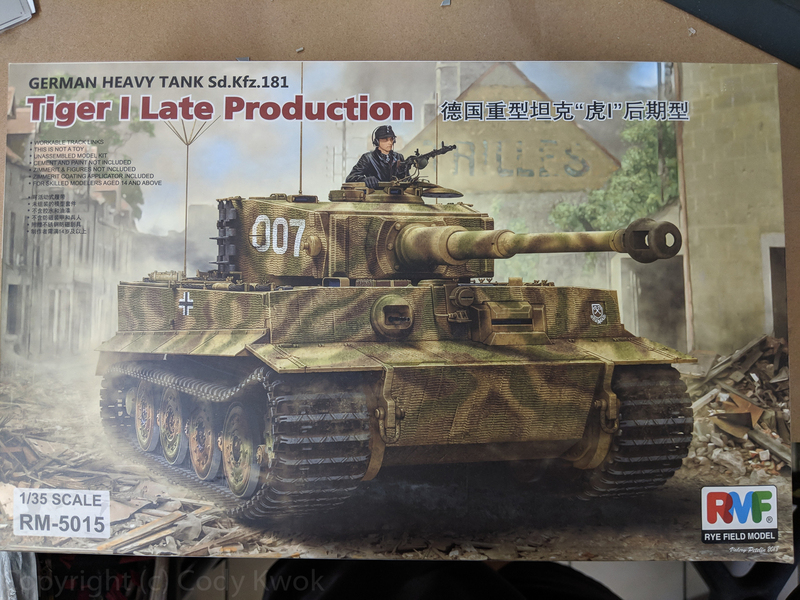 The kit builds up to a very nice late production Tiger and it is on par with some of the best Tigers on the market past and present, and you get very good details even OOB. I especially appreciate their inclusion of metal tow cables and PE tool clapses and clamps, but also with their styrene equivalent in case you don’t want to go through the PE aggravation. It is also nice to get indi tracks that are relatively easy to put together. Having to do your own Zimmerit could pose a challenge, but the kit supplied the rakes and by watching some videos it may not be too difficult. 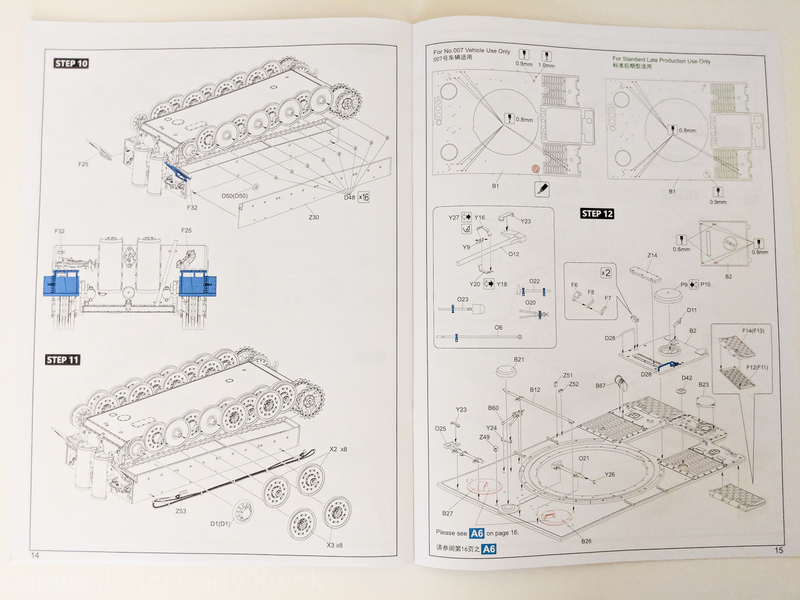 But more importantly the kit includes pieces that allows you to build other variants of late Tigers not illustrated in the instructions, so with a bit of references you can build some pretty cool vehicles. I am almost certainly going to get another kit. Incidentally this is my first review and I’m no Tiger expert, so please correct me if I got anything wrong here. Highs: Good details, includes both styrene and PE parts for details, relatively robust workable tracks, includes many undocumented extras to create a wide range of late Tigers. Easy to follow instructions. Lows: Zimmerit is DIY, indi tracks may put off some people, instructions did not properly document options for the different variants. They could do better research as each late Tigers are slightly different. Verdict: RFM’s Tiger line up continues to impress with this new variant. 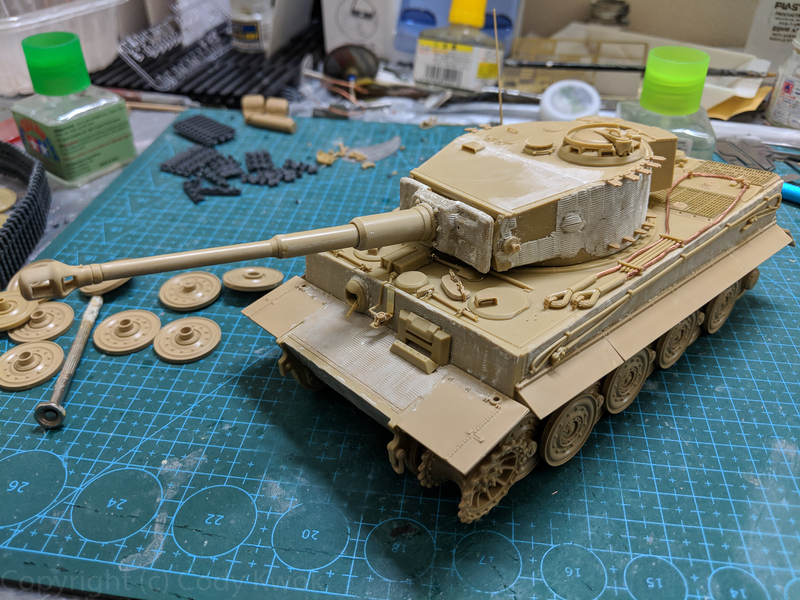 If you can do your own Zimmerit and have the patience for the indi tracks or replace with metal ones, you’ll have yourself a kit that can build into many different late Tigers beyond what the kit offers. Highly recommended.